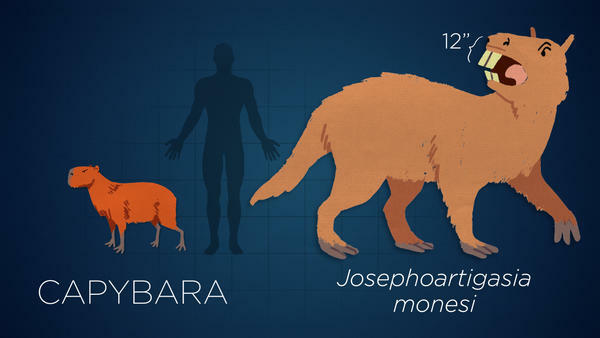 Josephoartigasia was a cow-size rodent that lived 3 million years ago. What's so great about living large? A size advantage can help you escape predators or attack prey, and crowd out others for resources. During cooler periods, larger animals may find it easier to stay warm. And, interestingly, giants tend to need to eat much less, relative to their size, than pipsqueaks. The past is packed with monsters! Behemoths by the dozen! Let's meet these fossils (and their less colossal modern cousins). And that's just the beginning. There's more — I could go on! Stupendous Stupendemys! Don't forget Procoptodon! The armoured Doedicorus! Meganeura's footlong wings! The plus-size penguin from Peru they call the Water King! Balaenoptera musculus. Its common name? Blue whale! Many of the huge animals in this video lived in the Pleistocene, roughly 2.5 million to 11,000 years ago. Their extinction over the past 60,000 years has been linked to early human hunters and to a changing climate. You can see all these species in infographic form on our tumblr.